The ultimate guide to Galtur ski holidays in 2019 & 2020. A cosy town at the end of the Paznaun valley, with a load of great views, Galtur is a hidden gem. Intermediates will love it here but with the local ski area divided into 6 sections, offering different ways to enjoy the mountain - everyone will find several reasons to enjoy this area. Galtur sits at the end of the Paznaun valley, which connects the resorts of Ischgl, Kappl and See along the Silvretta road. It’s not the most well known of the Silvretta resorts (neighbouring Ischgl claims this crown with its legendary après ski) but at 1600m, Galtur is the highest. This very traditional, quaint village centres around a pretty church and has some beautiful, old-fashioned architecture. Here you’ll find accommodation based around hotels and apartments as well as various restaurants, bars and a sports centre. Since 1997, the village has been labelled a ‘climatic health resort’ for the clean quality of air (it’s a haven for hayfever sufferers in the summer months). Innsbruck Airport is only an hour’s drive away. A free ski bus (included in the pass) whisks you to the small hamlet of Wirl (less than 5 minutes down the Silvretta road) from which you can access ski area via the 8 person Alpkogelbahn bubble lift. The area has grown gradually since 1950 with lifts added slowly over time. There are now 11 lifts here, which may not sound a lot but the total lift capacity is respectable enough at 13,000 persons/hour – so queues shouldn’t be excessive. 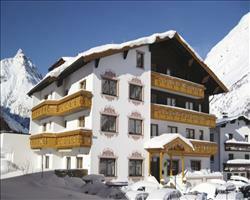 There are 2 main ski passes to choose from. The first is the Silvapark pass which covers the 40km skiing in the Galtur area (including some fantastic children’s zones which are a huge draw for families). If this isn’t enough, you can upgrade to the Silvretta ski pass –which gives you access to a whopping 300km of pistes including nearby resorts Ischgl, Samnaun, Kappl and See. 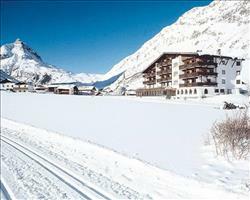 The Silvretta is fantastic for intermediates but has oodles for all snowlovers – whatever their ability. With both ski passes, you’re entitled to a free service around Galtur and the Paznaun valley. View our detailed Galtur snow forecast or snow report and see all live webcams, piste maps, road and travel maps and lift pass prices. For a picture of historic snow conditions see the snow depths month by month with our Galtur snow history. This is a fantastic place to introduce little skiers to the slopes. Children will love the Adventure Land area - the ‘Cross Run’ course is packed with gentle turns, Soppaland has tunnels down the mountain and the fairytale themed Marchenwald trails between the woods are lovely too. Beginners have 6km of piste to explore - the Blue 3 from the top of Familienabfahrt – a long, twisty run leading into the village – is a great place to practice turns. More confident skiers should have a blast in this area. For a challenge, check out the red runs near Kopssee – Red 9 being a particular favorite. Experts will enjoy the longest run in Galtur – the 3.2km steep and challenging run to near Vorarlberg – and some of the other black runs too. The various cross-country trails in the High & Nordic section are brilliant if you love that sort of thing –the S1 and S2 trails offer some great views and panoramas. Freestylers are well served too: the Zeinispark snowpark in the Action Park section is reshaped daily and involves rails, boxes and mini walls. Ischgl has the fabulous mile-long PlayStation® Vita Ischgl Snowpark complete with kicks and airbag jump if you want more freestyle action. Once a week, skiing continues well into the night with a 2.2km floodlit slope opened to the public. 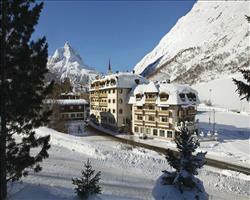 You do have to pay for a special night-time ski pass but this does include a free bus shuttle. It’s a wonderful experience– well worth setting aside an evening for. This may be a small village in the shadow of neighbouring après ski hot-spot Ischgl, but that doesn’t stop Galtur having plenty to do when the slopes close. The Huber’s Stadl is the bar most punters head to as the day ends - its wonderful rustic feel makes it a lovely place to go of an evening. As the night goes on, the party continues onto some of the livelier clubs like Pyramide – which stays open until 4am. If you’d prefer a quieter night visit the Weiberhimml – a cosy mountain bar where you can ski back down to the village under floodlights. Whether you’re going out or not, you’ll need a bite to eat. We love the ‘Frozen Water’ Café and the Panoramatenne for their fantastic views of the mountains. 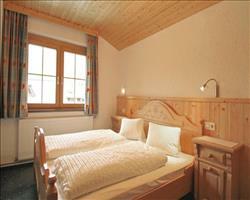 The Tiroler Stube is praised by many and there are a fair few pizzerias including Peppone. The ice rink is normally open a few days during the week and offers great fun for the entire group. Go to the Sports & Cultural centre if you want even more action – it has any sports facility you’d want from pools, to tennis courts to table football tables (it counts!). It even has a restaurant, the Aquarena – where you can reward yourself after a serious exercise session. 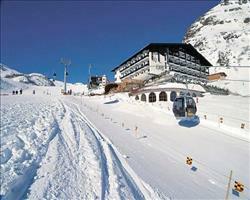 Ischgl is only a free bus ride away – so travel there for one special night of après-ski. 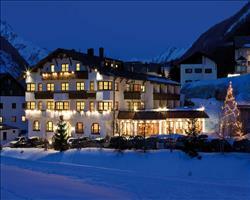 It has loads of fantastic clubs and bars– our favourites include Pascha, Kitzloch and Freeride. If it’s on when you’re there, the mountain concerts that happen at the beginning and end of season (and sometimes during it) are well worth getting tickets for – previous years have featured huge pop music names like Rihanna, Kylie and Elton John! When is the best time to ski Galtur? Galtur’s slopes are mainly north-facing and there are 63 snow cannons and 6 piste machines – all of which should mean that runs are decent towards the end of the season. The slopes go up to 2300m – head above 2000m where you’ll usually find the best conditions. The quickest way to reach the top of the mountain (and best snow) if conditions aren’t great is to use the Birkhahnbahn – it drops you off near the Ballunspitzbahn lift which carries you up to the highest pistes. If snow is poor and you need something to do, spend an afternoon at the sports centre - the bowling alley doesn’t open until the evening but facilities like the pools and tennis courts are open and they should be an active, enjoyable way to spend an afternoon. The ski area is absolutely brilliant for families with 2 zones dedicated to children and learners, Zwergerlwelt or Kids World is a fantastic kindergarten where little ones can play in the snow and learn the basics on skis in Bambiniland – day care is available for full or half days, allowing you to enjoy the slopes with peace of mind. Adventureland includes Soppaland – where children can ski through wooden tunnels and over turns and waves, and the fairy-tale themed Marchenwald trails lead down between the trees. Children can learn about local wildlife at Jägerpfad and there’s a cross route and traffic route which make skiing easy and fun. Older and more experienced skiers will love the Actionpark, where you’ll find a speedway, mini Snowpark and mogul run and families who have been skiing for years might want to consider hiring a guide to explore the powder in Heroes kingdom. Even when the slopes close, families will find plenty to do in Galtur. Weekly night skiing on a 2.2km floodlit slope is something all confident skiers should try. If families want to eat out, there are a load of great restaurants – the Panoramatenne is one to visit with its magnificent mountain views. Whether your group is looking for an affordable holiday, a great location or loads of facilities, Galtur is unlikely to disappoint. The ski area is cleverly divided into 6 different sections, meaning there’s something for any ability of skier or snowboarder. Piste Paradise is the name given to the usual runs - novices will love beginner runs like the twisty Blue 3 from the top of Familienabfahrt and there’s 24km of intermediate terrain for more confident skiers – try out the red pistes near Kopssee. You’ll also find Heroes Kingdom if you fancy hiring a guide for a group tour of the local powder and Actionpark for some moguls, freestyling and race runs. For après ski, head to the Huber Stadl as the lifts close– it’s a local favourite. Then pay a visit to the terrific Pyramide club, it often has DJ’s and live entertainment to add to the atmosphere. There’s ice skating in the village – and night-skiing is normally available once a week. Our accommodation in Galtur ranges from hotels in good locations to those with extra facilities (including Wi-Fi or internet, bars and saunas). Large hotels are ideal for groups as on the off-chance that any stragglers want to join the party later on, there may well be rooms spare. Enjoy your own bedroom and shared areas and facilities like bars, restaurants, swimming pools and spas. Minimise hassle by booking somewhere near the slopes, lifts or ski bus stop and enjoy the best of the après by opting for a property in the centre of the action.